Bring the County Fair home to your bird. You and your bird can share a bonding experience with this cute acrylic ring toss. There are several ring shapes and colors for your bird to learn and have fun. Watch the video below to see our Severe Macaw Buddy as he demonstrates his Ring Toss skills on Animal Planet's "Your Pet Wants This, Too"
Bird trick training ring toss toy peg measures 2.5" x 2.5" x 2.5". Contains for 4 colored marbella shapes measuring approximately 2" x 2" and comes with the following colored shapes: 2 squares and 2 circles. Ring Toss Bird Trick Training Toy for Amazons/African Greys5CeileJanuary 15, 2016Didn't take Solomon (Eclectus) long to figure out how to put each ring on. First I rewarded him after placing just one ring; then two, etc. Now he places all four on and gets his treat. I love to use pine nuts because he loves them and they're soft and quick to eat. Ring Toss Bird Trick Training Toy for Amazons/African Greys5D MooreMarch 6, 2014My African Greys all enjoy the ring toss bird toy! Some try to actually drop the rings onto the base but one just likes picking them up and flinging them! Either way it keeps them busy when out on their playstands. 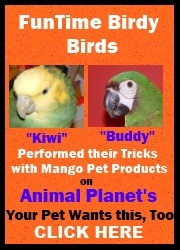 Thanks for this fun product for our feathered kids! Ring Toss Bird Trick Training Toy for Amazons/African Greys5Jenny HebertMay 25, 2013I think she likes it but we're still getting used to working with it. The bright colors really get her going. Ring Toss Bird Trick Training Toy for Amazons/African Greys5SharonFebruary 12, 2011Jasper loves this toy. Loves to take them off and getting the hang of putting them back on. But really likes to play with the different shapes.